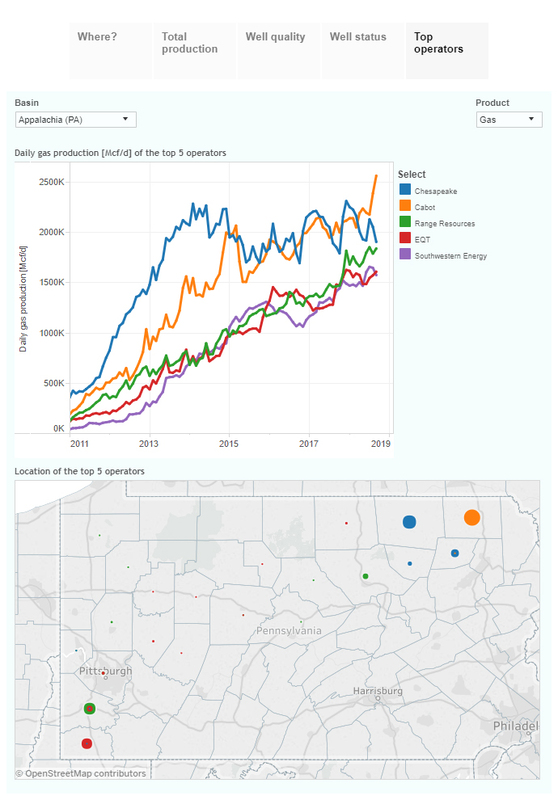 This interactive presentation contains the latest gas (and a little oil) production data, from all 8,512 horizontal wells in Pennsylvania that started producing since 2010, through September. Gas production from horizontal wells came in higher again in September, at 17.4 Bcf/d. 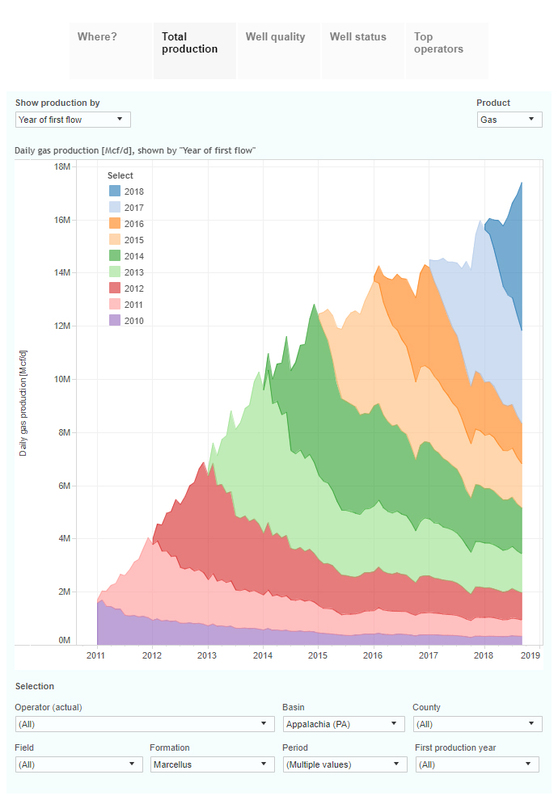 Output has grown by about 10% in the 4 preceding months, driven mostly by an increase in well completions; In both August and September, 107 wells started production, the highest since the end of 2014. This increase in completion activity didn’t have a negative effect so far on well productivity. 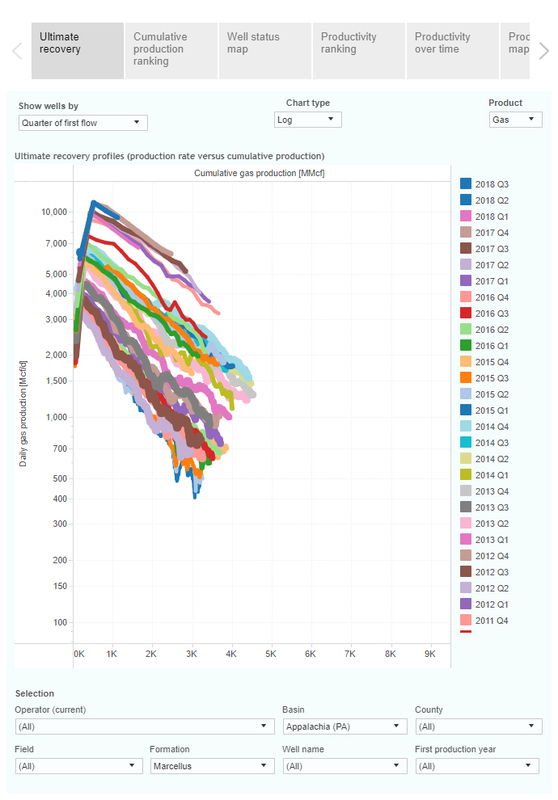 In the ‘Well quality’ tab you’ll find the production profiles for all these wells, averaged by the year in which they started. Group the wells by the quarter in which they started (using the ‘Show wells by selection’), and you’ll see that the best initial performance came from the wells that started in Q3 this year, at over 13 MMcf/d. Of the 5 leading operators, Cabot stood out as it increased gas production by 18% in just 2 months (see the final tab). Well design has changed significantly over the years; in 2012 about 4 million pounds of proppant was used per completion, on average, while this has recently increased to over 18 million pounds. 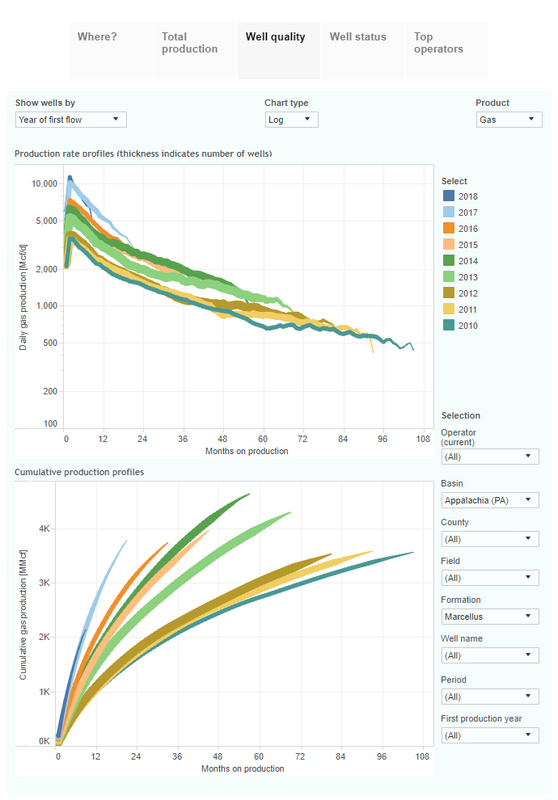 The plot clearly shows how this has had a positive impact on well productivity. Early next week I will have a new update on the Niobrara. If you missed our live chat last Tuesday with John Sodergreen and Het Shah, about the Permian Basin, you can still read back our discussion here in the enelyst ShaleProfile Briefings channel. Next week Tuesday, at 10:30 am (EST), we’ll take a closer look at gas production in Pennsylvania, and there is enough time to ask questions.